I’m so excited to share this easy DIY with you today. Last week I painted my gross laminate kitchen countertops to resemble marble. It was SO EASY, not messy at all and only cost me $15! Notice the visible edges and overall dingy color? Yuck! What, you don’t love gold, brown and black specks? Ha! Me, neither! How about some fresh white, shiny faux marble counters, though? Finally my kitchen looks and feels clean! Here’s a close up of the veining I added to create the “faux marble” look. I’ll admit I was totally chicken on overdoing it….which resulted in me under-doing it, probably. Want the low down on how to achieve this look? Here we go…. The only thing I purchased for this project was the Polyuretane. I had everything else on hand, so total project cost was only $15! Remove all items from your countertops and thoroughly clean them. Then clean them again! Tape off any areas that you don’t want to get paint on. Backsplash, sink, stovetop, etc. Apply a coat of the primer and let it dry. If you have dark counters and you’re going light, add a second coat of primer to knock down the color. One the primer is dry (mine only took about 45 minutes) apply the paint. Apply thinly, in one direction to minimize brush strokes. Using the artist’s brush (or feather) and gray paint, draw veins on your countertop surface and down the edges. Don’t be afraid of how awful it looks at this point. The next stage will make it look less scary! Continue painting on the veins until you’re happy with the effect. If you mess up, you can soften the paint with a damp sponge. Let dry for 30 minutes. With your foam roller, apply a second full coat of white paint to the counters. Let dry. If the veining is still too prominant for your liking, apply one more coat of paint. Allow to dry for 8-12 hours. Finally, you will need to seal the paint so that your counters will be waterproof and functional. I chose to use a semi-gloss quick-dry poly after initially using satin. The satin just wasn’t shiny enough so I switched. I definitely recommend using semi-gloss or gloss. Apply the polyurethane with a wide synthetic bristle brush. Being careful to move in on direction to avoid brush strokes or lap marks. If you use the same brand I did, one coat is all you will need. Light use is fine after about 6 hours. Your counters will need a 24-48 hours before they are fully cured and can be used as normal. Let’s compare before and afters! Finally my counters look clean! Doesn’t the entire kitchen look so much brighter, too? 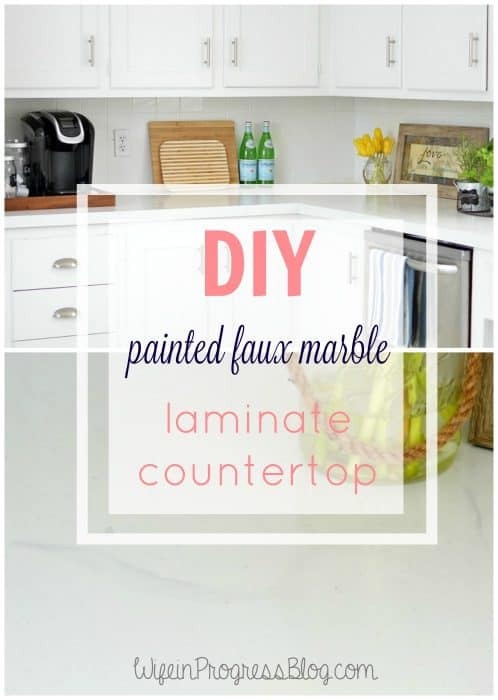 Is this something you’ll consider doing to your old laminate? It’s a quick and easy update and certainly one that’s worthwhile! 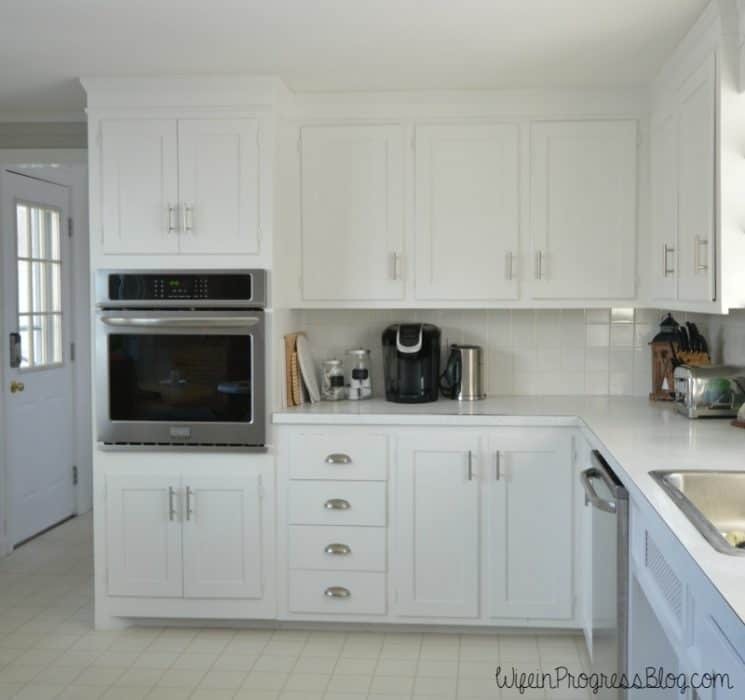 We will remodel our kitchen eventually – but for now, this is a great quick fix! Your counters look great! How long has it been and how are they holding up? Thanks Nancy! It has been just about a year…we actually just replaced them last week because I put a hot pot down and melted a burn into them. Other than that, they held up surprisingly well! You definitely need to be careful not to let anything like tea/coffee sit on them or it stains. Your posts are incredibly easy to understand and greatly detailed. Im truly blown away. I really want to try this in my kitchen, however, I’m curious to know how it would look if I wanted a different/darker color? What steps would I need to take to go darker? Hi Amanda! Thanks so much! The process would be exactly the same if you wanted to go darker. In my old house, I actually did a “faux soapstone” effect with matte slate colored paint and white veining. If anything, the darker color is easier to work it as it hides more sins and is less likely to accept stains down the road. I hope that helps! When looking at the lava white color on pureoriginalpaint.com it seems a lot more yellowish than your countertops. Does it dry as white in person as it looks in the photos? Thanks! Yes – it’s very white! I don’t know if there was an error with mixing it but mine had no discernible color other than bright white! What a great idea! From the photos, it looks like you did a great job. My only concern would be the latex shrinking or chipping down the road. Once, many years ago, I painted my kitchen with latex paint & had no idea that the previous owners had used an oil based paint. I was so confused & angry when my beautiful freshly painted walls began to bubble up- after they dried!!! I was able to pull the latex off in big rubbery sheets 😖 That was a huge lesson for me concerning different kinds of paints! This is only a temporary solution (for maybe 2 years) until we completely redo our kitchen. I used a good quality primer which is essential to prevent shrinking or peeling. It’s also well sealed with poly so I’m not worried about either of those things happening! Looks so great! 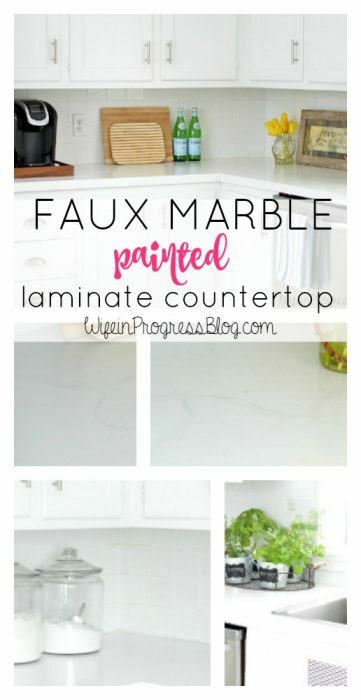 I’m hoping to replace my laminate in a few years for some quartz that looks like marble! This is AMAZING!!! I just finished painting my cupboards and floors and have been WANTING to paint my countertops!! I think I’ve found my method of choice!! These turned out SO well!!! Congrats!! Thanks Sarah! I’m pretty amazed myself at how well they turned out! !